Credit: Jin Koda, Masafumi Yagi, et al. using the Subaru Telescope (National Astronomical Observatory of Japan). Last year, astronomers turned an array of small telescopes named Dragonfly on the famous Coma cluster of galaxies, located 340 million light-years from Earth, and discovered 47 "ultradiffuse" galaxies whose stars are so spread out from one another that they look like ghostly phantoms. Some of the galaxies are as large as the Milky Way but emit only a thousandth of its light. Now, as other astronomers will report in an upcoming issue of The Astrophysical Journal Letters, the mighty 8.3-meter Subaru Telescope atop Mauna Kea in Hawaii has revealed 814 additional examples. 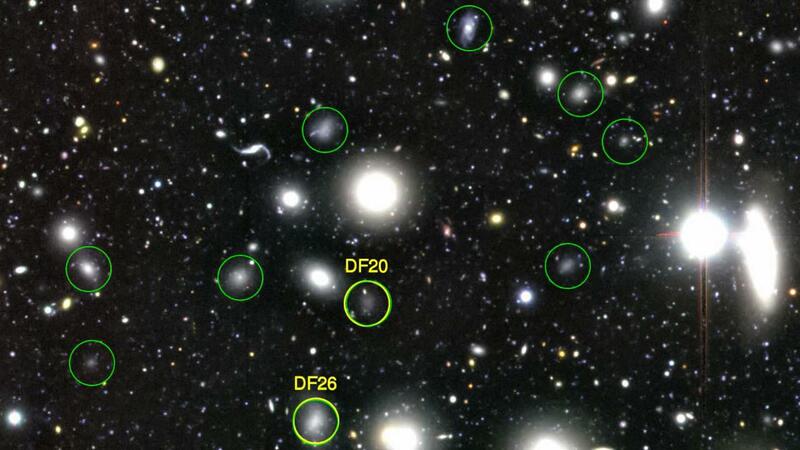 Eight of them appear inside the green circles above (each circle spans 31,000 light-years); the yellow-green circles enclose two galaxies Dragonfly found earlier. The galaxies have old stars and lack any gas to make new ones. Coma's glut of these peculiar galaxies suggests to the research team that they are a special product of the cluster environment, in which their gas is stripped away by the gravitational pull of nearby galaxies and “knocked off” when they smack into hot gas that pervades the cluster. In addition, the entire cluster grabs gas ejected by the galaxies’ exploding stars, further depriving them of the material they need to create new ones.